Some of you might now know, but this blog post is currently being posted from Iceland! I am road tripping around the country with my sweet friend, Candace, and it has been extremely hard to find enough wifi to upload a blog post. Some times we find enough to get GPS to get us from one town to the next or to post a picture on social media, but it is few and far between! So I apologize for the delay in Andrea & Chris’s Herrington On The Bay Wedding. Usually we always have our wedding blogs posted by Tuesday or Wednesday but obviously I have had a few obstacles in the way! 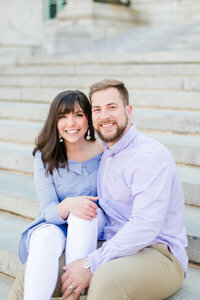 It seriously feels like just yesterday that we were meeting Andrea and Chris in La Plata at Red Oak Bistro for their couple’s consult meeting! We ended up talking with them for a couple hours after hitting it off right away. Chris and Tony chatted about cars while Andrea and I rolled our eyes at their conversations. Now their MARRIED! It seems so surreal. Andrea and Chris exchanged their vows at the beautiful Herrington on the Bay in front of their very closest family and friends. It was a beautiful day! The weather was perfect – I even got a tan line from just being outside for the ceremony and portrait time! And their reception… well we can certainly say that Andrea and Chris’s friends know how to celebrate a marriage! There was tons of silly dancing and even games on the dance floor. We seriously couldn’t be more happy for these two! To view more Herrinton on the Bay wedding s, browse the links below!